Kustaa Frederick Bergstadius worked as a clerk and immigration agent for the Chicago, Milwaukee, and St. Paul Railroad, a.k.a. The Milwaukee Road. The Milwaukee Road had run a line north from Aberdeen, South Dakota. Bergstadius was given the job of selling “good land” along the route. It should have been Bergstadius’ job to visit location but he instead sent his friend, Erick Pikkarainen. On Pikkarainen’s return, he himself immediately laid a claim to land adding further proof to his positive report. In August 1881, Bergstadius himself went and plotted a town 25-miles along the route and named the town after himself. Fortunately for those living in Frederick, he used his middle name. He also plotted out his own home at Fourth Street and Third Avenue. 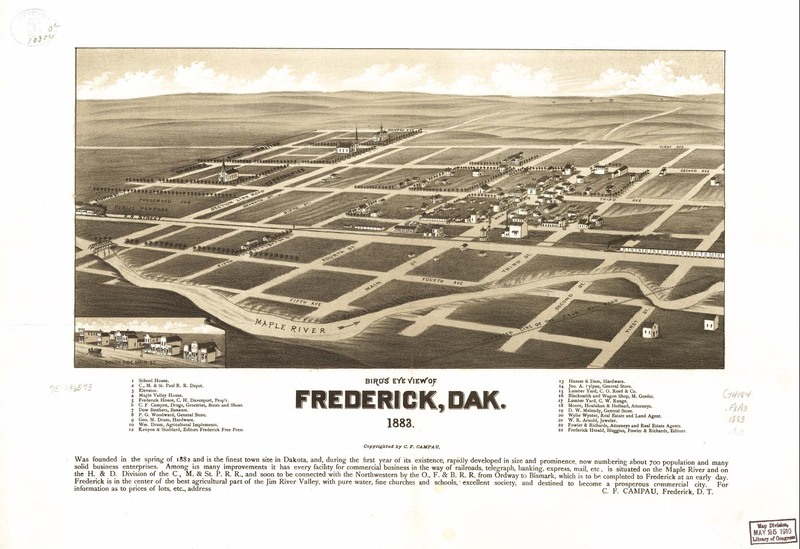 The railroad reached Frederick the following month and continued on to Edgeley a few years later. Just outside Frederick, Bergstadius plotted another township. This one was named after his home town of Savo. Bergstadius’ success came from his knowledge of Swedish, Finnish, and English. His command of the languages had brought many to him for his translation abilities. He used those skills to publish advertisements, letters, and brochures promoting his new township. Most of the Finns that settled in Savo came from Massachusetts or Michigan but were originally from Vaasa and Olou. Savo Township started to organize on April 24, 1884. Concerned over legality of the first meeting, the township organized on June 10, 1884. Three days earlier the foundation had been laid for the first church. The town had two congregations and each had a church by the turn of the century. There was a school, post office, and general store. Savo had the first, and now only, Finnish Club in South Dakota. They even had a brass band. According to the U.S. Census from 2000, 541 people of Finnish ancestry still live in Brown County. Fredericks and Savo are in Brown County.